Learn more and stay current with exclusive content to help you improve your skills and get better results! What is My Inner Circle Mentorship Program? In creating my Inner Circle, my goal is to provide you with a ton of value for very little money. For a fraction of the price of attending a single seminar, you get exclusive presentations of my latest content AND an entire archive of my best presentations. Plus, you can access the content from anywhere and anytime! I’ve been talking about how much I think online learning is going to change our fields. I believe that short bursts of information that are updated frequently is the best way to learn and apply the new material IMMEDIATELY! Plus you get to tap into my mind of what I am currently thinking today. The info that I am presenting is going to be exactly what I am thinking and working on at the moment. You can’t get any fresher than this! Journal articles take months to publish. Books take years to publish. My Inner Circle content is as current as can be. Exclusive presentations of my newest content - what I am doing and thinking TODAY! EXCLUSIVE members only contests and discounts on products, both mine and many of his friends! New content each month and access to ALL my past content! There will be no changes to the current amount of information that you can find at MikeReinold.com. I will still be posting my usual amount of content for all viewers. As you browse my site in the future, you may see premium content for Inner Circle members only. This will be even more great quality educational content. In addition to the presentations, from time to time I will have other exclusive Inner Circle members content such as interviews, articles, and downloadable copies of my journal publications, and exclusive discounts on other education programs from myself and friends. I also make myself available to Inner Circle members in our private members only Facebook group. Ask questions, share new articles for discussion, get advice on specific cases, and more! Inner Circle members will also be notified when I am conducting live Facebook chat Q&A sessions so you can jump on and ask a question or join the discussion. Each month I will release new content. Some will be recored presentations of inservices I am conducting at Champion, it's like you're part of our staff! Others will be live webinars. I will announce a time and date to conduct a live webinar where you can log in from anywhere in the world and watch. I’ll be discussing a variety of topics in this format ranging from new thoughts and techniques that I am trying to elaborating on some of the content posted on my site in the past. Each session will have a live Q&A session where you can interact and ask questions on whatever topic you would like. I will try to vary the days and times of the webinar to reach a wide variety of people in different locations as best I can. Can’t make the live webinar? No problem! All webinars will be recorded and posted online for your to watch at your convenience. Inner Circle members will also get access to all the past archived webinars, regardless of when you joined the program. Videos will be watchable from any internet connected computer or device, including iPads and iPhones. 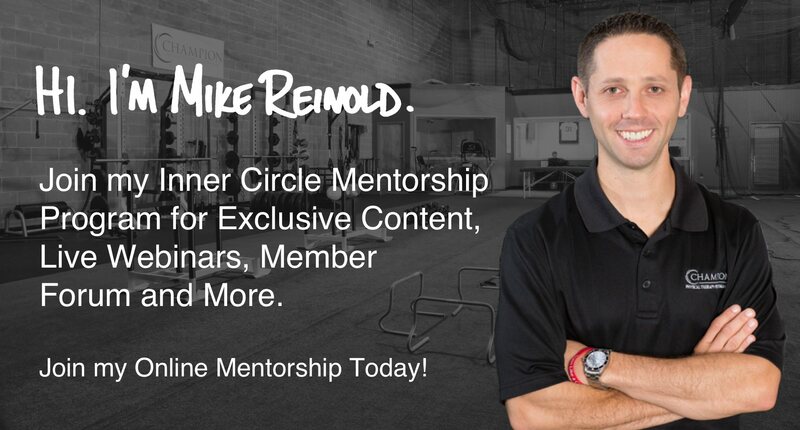 Please note, these webinars are exclusive to MikeReinold.com Inner Circle members and can not be found anywhere else, including RehabWebinars.com. Preventing Little League Pitching Injuries – Really, all youth pitching, not just Little League age. Get Started Now! Join Mike's Inner Circle Mentorship Program Today! What Are People Saying About Mike Reinold's Inner Circle? What Are You Waiting For? Start Learning More and Advancing Yourself Today!